Swimming pool chemicals include a variety of disinfectants and sanitizers designed to control the growth of algae, bacteria and other forms of infectious organisms. Chlorine is the most common type of disinfectant and sanitizer used to clean pools. Chlorine gas is commonly used for cleaning large pools. Storing pool chemicals properly will result in less hazards including spills, cross-contamination, container damage and exposure to personnel. Storage tips are listed below to ensure safety and compliance. Store pool chemicals separately. Pool chemicals are incompatible and can react, resulting in fires or toxic gas. Segregate chlorine products (ex. store liquid chlorine separate from calcium hypochlorite). Do not allow chemicals to come into contact with acid, grease, oil or other lubricants. Maintain pool chemical storage atmospheres (i.e. properly clean spills, leaks etc.). Keep chemicals stored in a cool, dry atmosphere. Avoid direct sunlight and high heat. Keep up with routine inspections to control container damage. Store pool chemicals in a locked chemical storage building, equipped with an EPA compliant sump containment. Store chemicals in the original, manufacturer’s container. Do not dispose in trash or sewer. Avoid mixing chemicals or chlorine products. Use designated tools for each type of chemical to avoid cross contamination. Ensure an Emergency Response Plan is in place. To ensure workers are safe, chemical handling must be properly managed. Only trained personnel should handle or store these chemicals. Safe practices include reading product labels or Material Safety Data Sheets (MSDS) before handling, utilization of labeled containers (do not use unlabeled containers), and the usage of appropriate handling and Personal Protective Equipment (PPE). 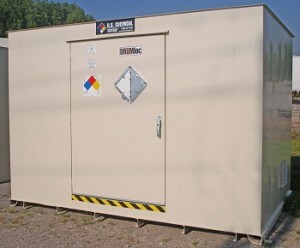 Safely contain pool chemical storage with US Chemical Storage. Pool chemicals can cause injury if they come in contact with the skin, eyes, respiratory or digestive system. Pool chemicals immediately react with moisture; PPE including safety glasses/goggles, shoes, face shield, gloves and aprons are advised when handling these chemicals. Call or visit us online to learn more about pool chemical storage or to receive a free chemical storage consultation.